English 3P Honors: American Literature Krash Kourse Final Project! Project Goal: After investigating and analyzing perspectives on contemporary American identity through texts which include art, poetry, and nonfiction, students will complete a “Krash Kourse Video Project” which explores the impact of diverse voices on American literature and culture. After completing research process, students will identify significant contemporary Mexican American artists and writers and make recommendations for Mexican American Literature & Literature curriculum. Tuesday: Students will select and research contemporary Mexican American writer, artist, musician, or playwright and write a biography to feature as a contemporary voice for Mexican American arts and culture. Wednesday: Students will selected an example of the artists work and write a summary analyzing significance of Mexican American writer, artist, musician, or playwright to feature as a contemporary voice for Mexican American arts and culture. Thursday: Students will find a quote by the artist and explain what it reveals about the work and their contributions to Mexican American literature and culture. English 3P Honors Last Week Updates! After investigating and analyzing perspectives on contemporary American identity through texts which include art, poetry, and nonfiction, students will complete a “Crash Course Video Project” which explores the impact of diverse voices on American literature and culture. Monday: Final Video Rubric, Begin Close Read Richard Wright’s “Black Boy” and explore what idea his autobiographical story conveys about identity. English 3P: Last Week of 2014-15 School Year! After investigating and analyzing perspectives on contemporary American identity through texts which include art, poetry, and nonfiction, students will complete a timed write essay which explores the impact of diverse ethnic voices on American literature and culture. Monday: Close Read Richard Wright’s “Black Boy” and explore what idea his autobiographical story conveys about identity. Wednesday: Reflection on Richard Wrights “Black Boy” and close read Sandra Cisneros’s “Straw Into Gold” What fairy does the title of Cisneros allude to? Friday: Turn in Books and Notebooks Clean Out Portfolios: ON MONDAY PRINT OUT ESSAYS WITH COMMENTS FROM TURNITIN.COM!! After investigating and analyzing perspectives on contemporary American identity through texts which include art, poetry, and nonfiction, students will complete a portfolio which explores the impact of diverse voices on American literature and culture. 1. What is IDENTITY and how is it shaped by historical events during the 20th Century? 2. How does IDENTITY shape perspectives of historical events and conflicts? 3. In what ways does symbolism in literature, art, and theater serve to understand the emergence of a 21st Century American identity? After completing CORNELL NOTES on “Contemporary Literature Since 1939″ students will be able to write a summary that identifies significant historical contexts and issues that inspired American Literature after World War II. III. Post Reading: Students will write a paragraph that describes the historical context of contemporary American Literature. 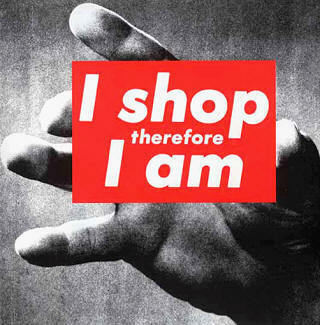 I. Pre-Reading: Close Read Barbara Kruger’s “You are Not Yourself” and explain what it reveals about identity.